The first two pages sound like war games at Camp Pendleton and a Happy Anniversary wish for me—one month as of the day before you penned this. 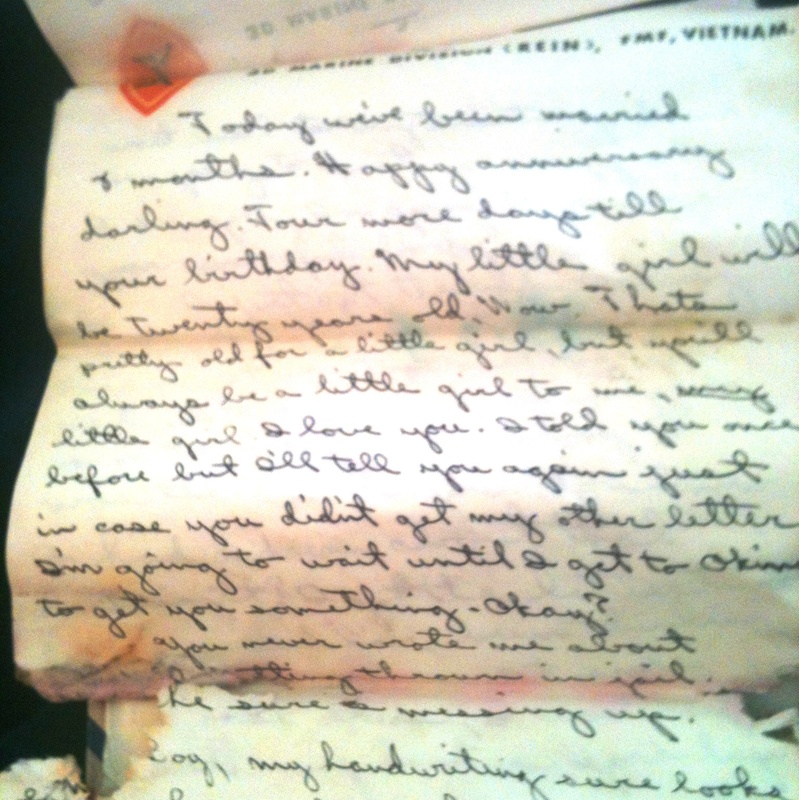 No date on the letter and no postmarked envelope yet I know the date you took the time to sit under a tree and send love and wishes my way: June 8, 1966. Happy Valentine’s Day! I looked for old Valentine’s greetings from you but didn’t find them. 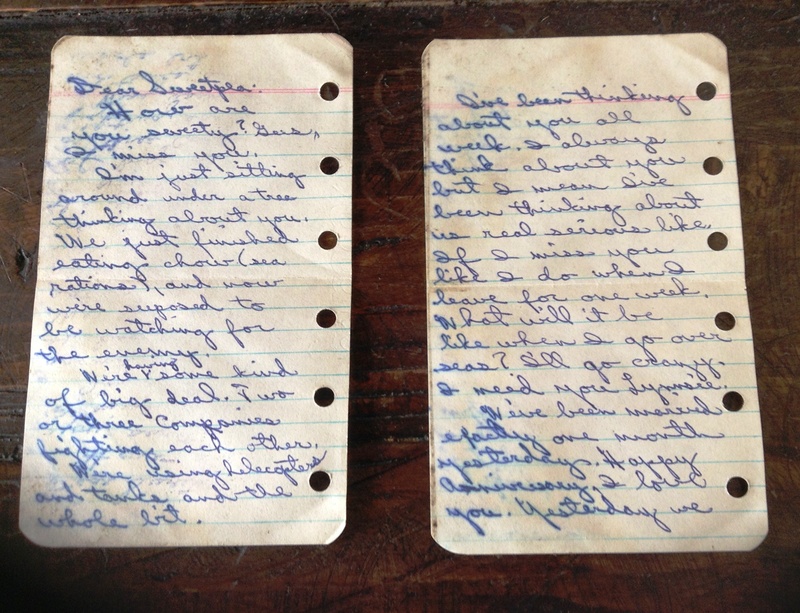 A few years ago Aimee asked to borrow a fistful of letters you’d written to me from Nam and I think what I handed over included the last weeks of January and the first weeks of February, 1967. The sorting I’ve done and chronological ordering of words I still own from you leaves a gap, an emptiness, between 1/8/67 and 2/27/67. I opened 1/8/67 and found an odd bit about a trade I’d made and birthday greetings. 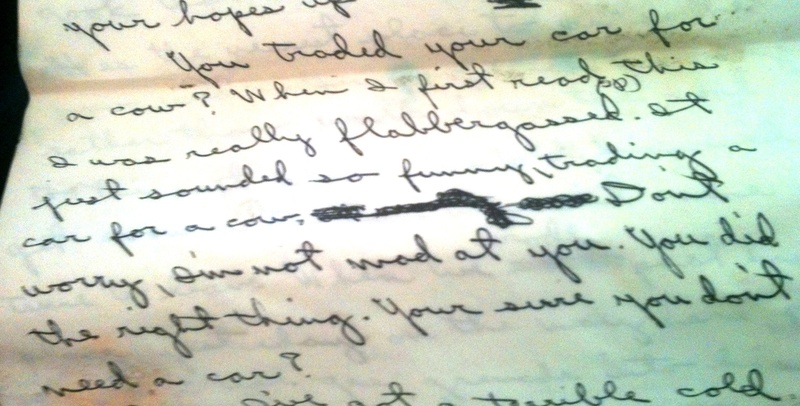 I laughed out loud when I read what you’d written: You traded your car for a cow? When I first read these words I was flabbergasted. It just sounded so funny, trading a car for a cow. Don’t worry, I’m not mad at you. You did the right thing. You’re sure you don’t need a car? Honey, it sounds more than funny. A car for a cow? The car had to be my mint green ’56 Buick. The trade had to be with my brother (although I don’t remember him owning a cow). He was four years younger, would’ve been nearly 16 and in need of a car. Maybe the cow came from Mama and Daddy in exchange for me giving the Buick to Randy? 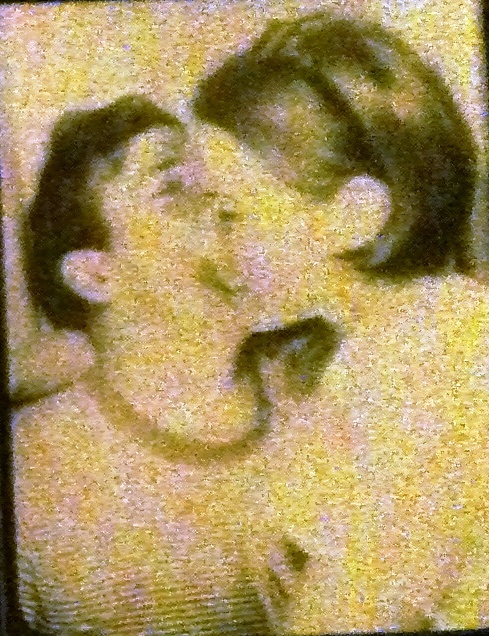 You wish me Happy Anniversary for 8 months of marriage. 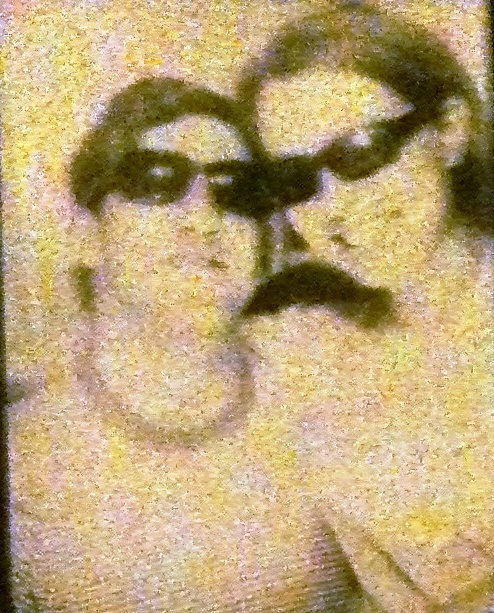 Ah, love, we made it through 22 years, eventually. Mostly good years–not always–but mostly. I’d take back all of the bad just to see you again. You also send greetings for my 20th birthday. Oh my. Twenty! I’m forty-seven years older now. You wouldn’t know me to look at. Or maybe you would. For me, of course, you haven’t aged a day–still 43–still brown-eyed and ruggedly handsome–still a perfect blend of Charles Bronson and Tom Selleck manli-man-ness. 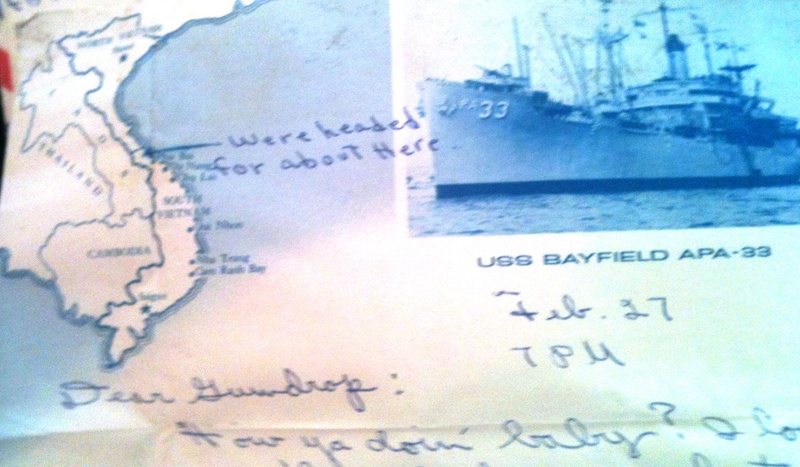 There are four letters postmarked February 27th on ship stationary. You were on your way back from spending several days with Paul in Okinawa and headed for the place indicated on the stationary letterhead. 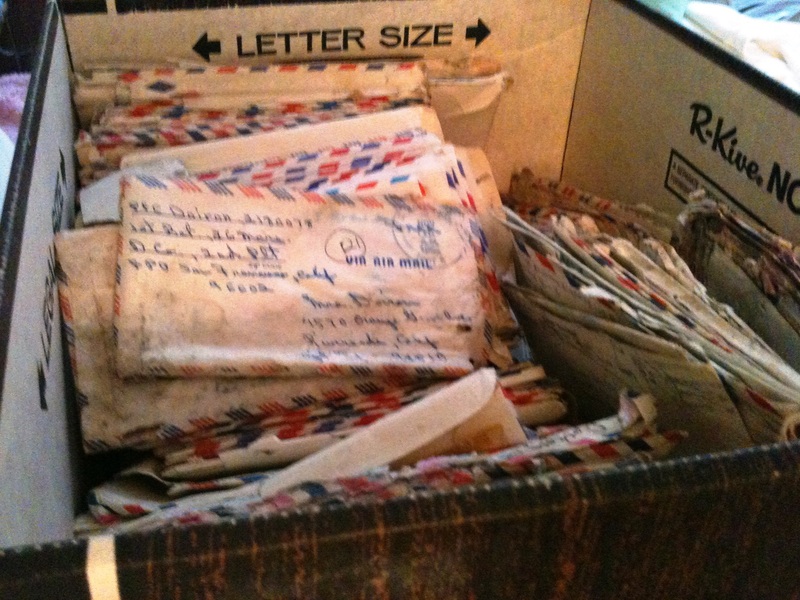 This one’s addressed “Dear Gumdrop” … I’d forgotten how many little names you had for me. Sweetpea was the one I remembered. And Lynnsie. Sweetheart and Darling and Little Girl. Short Change. I don’t understand “Short Change” used as an endearment. But without understanding the Why of it, I know in my heart that it was. One of the four letters included an idea you had percolating inside your homesick head, an idea about signing on for another six months overseas. The sign on would allow you thirty days leave and you wanted that leave to come home to me. Luckily, you talked yourself out of that bad idea before the letter ended by figuring out you’d be back in Nam after the 30 and not home again for another eight months. Alsie, I’m so glad you changed your mind. Who knows where that sign on would’ve taken you once you’d committed to it? You could’ve never come home at all, could’ve caught more than malaria, lost more than half a leg. Our children, those loveliest of lovely children (all parents themselves now), wouldn’t have been “ours”, wouldn’t have you living on within them, and within theirs. 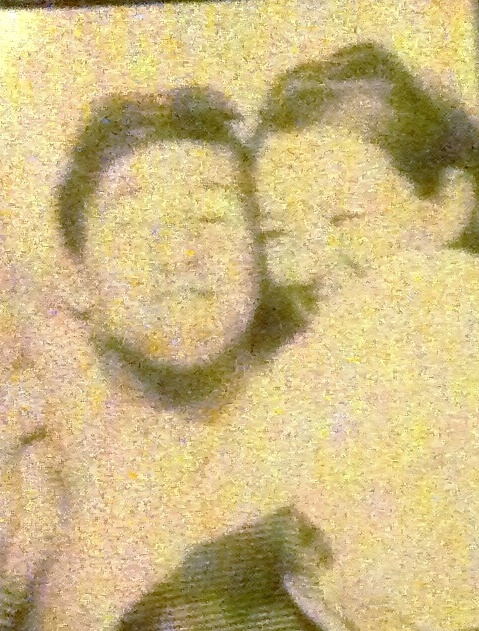 I love you my old best friend. 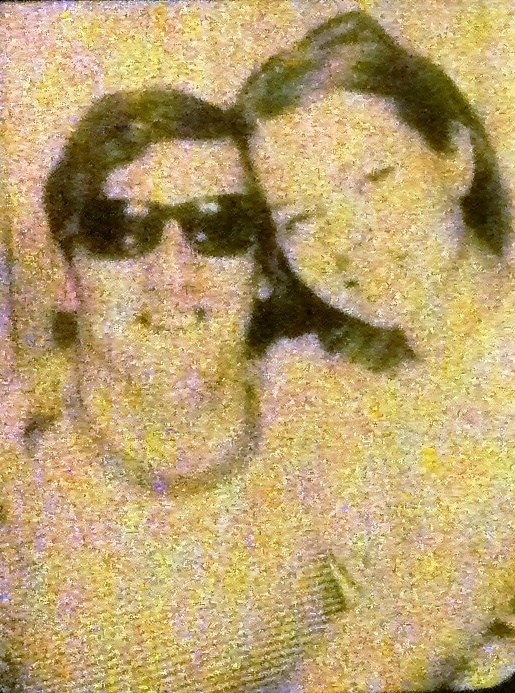 I miss you, my favorite Sweetheart ever on this earth. Laundry labels and loose stamps. Your name over and over again. A brass buckle. The brown bit near the bottom of the picture is Tyger’s repair kit: thread, needle, tiny scissors. 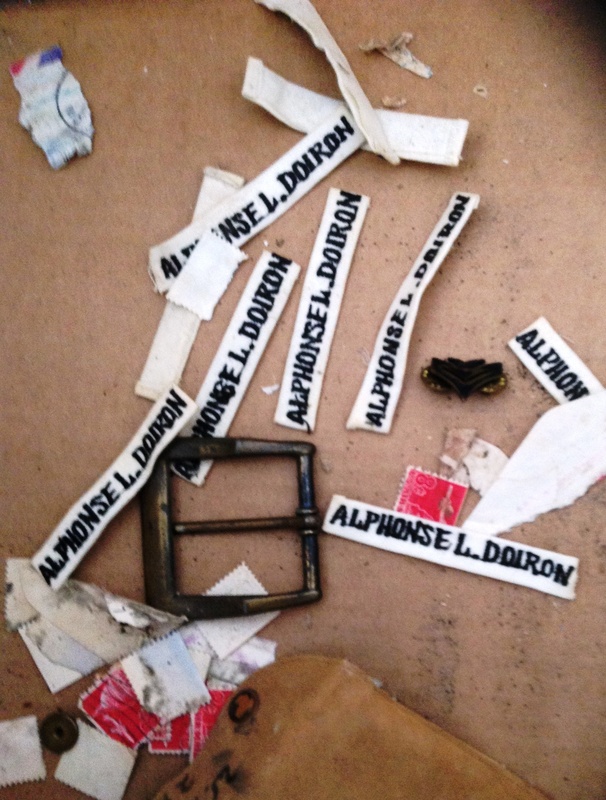 Did you borrow his kit to sew those labels in the collars and waistbands of your utilities and fail to return it? Sorry, Honey. That’s unfair. I know you couldn’t return it. Bad things happened. It’s Sunday and the sun is burning off the marine layer here at Rancho Santini. I’ve been living here at the edge of the ocean for two years now. It’s a good place to be. More about that later, if I have time. I can’t help but smile, remembering your patience when any tale that I had to share became side-tracked with offshoots and details and offshoots off other offshoots until neither one of us knew where I’d started or what the hell it was I’d intended to share. Can you tell? I haven’t changed much in the past quarter century! Finding the box came about because I’d been emptying the living areas of my belongings up in Cottonwood: Eight years of crafting supplies! Twelve-plus years of books! Forty-plus years of photos and memorabilia! (Let’s not talk about clothes.) I carried a whole lot of bin liner bags and boxes of “things” to the Salvation Army during the five weeks spent in Cottonwood. Your letters surprised me the first week—the eighth or ninth of November. Boxes are patient. They don’t grumble about where they’ve been stashed or how long they’ve been ignored. I knitted through my evenings, working a stockinette-stitched multi-colored shawl to the size of a poncho. The box just sat there, occupying the left side of the bed, a transparent bag of various yarns weighting down the lid. Honey, it was so much easier to knit a long row, turn the bulk of the shawl in my lap, purl a row back to the other end, than handle what was waiting inside that damned box. You’d have thought it was a box of snakes. Then, the lid was tipped. Had I pulled too hard on a tangle of yarn in the bag? Is this what set the lid on edge? I started to readjust it, but didn’t. Maybe my fingers were tired of knit-purl exercises; maybe the joints ached; maybe it seemed like an omen. Your left-slanted penmanship stared up at me from an envelope. The first letter lifted out of the box, postmarked Nov. 13, 1966. On November 12, 2013, I handled that envelope again. I felt a shiver. I mean, c’mon Alsie … there I was holding a gritty envelope stamped Nov 13 A.M. 1966 on the twelfth of November in 2013 … tell me that’s not bizarre! 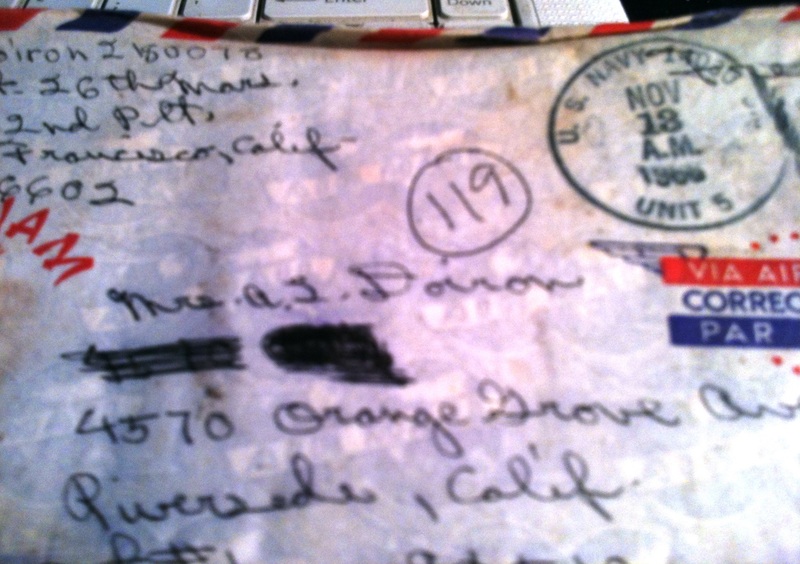 The letter inside was written November 11, 1966. 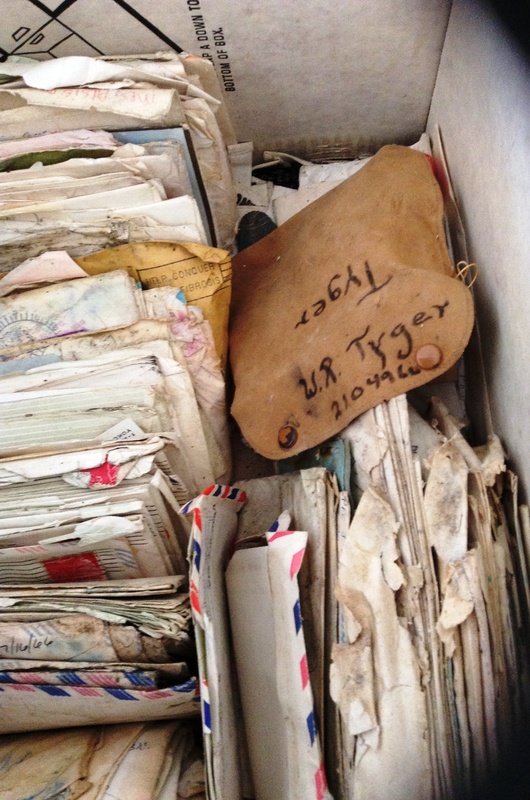 On the twelfth of November 2013, I’d opened your letter written on November 11, 1966 and posted on the thirteenth. Did it mean something? Anything? This alignment of numbers—11, 12, 13? It was the day’s date, a date that won’t reappear for a hundred years. I think it meant something—my tiny re-purposed-energy-blink-of-universe Alsie. Call me crazy, but I think maybe you twitched out there in the where-ever and set that lid ajar. The box was still half full when I took this picture. Bizarre as it may seem, I’m at a loss as to how to begin other than in the old learned way of an initial inquiry as to how you are combined with the hope these few lines find you well and able to take nourishment as Uncle Con* used to say. I wonder what “well” means in the afterlife? Not that I believe in an “afterlife”—at least not beyond the level of “energy becomes energy”—yet, for the sake of this letter addressed to you, I must believe (or imagine I believe) in something beyond life as I know it. You, Uncle Con, Mama, Daddy, so many others I’ve loved and been loved by are another sort of energy now. Un-nameable and unknowable. Yet, I genuinely believe you are all part of this universe. Specks of ash and dust. You’re also in my head, as real as memory can make you. 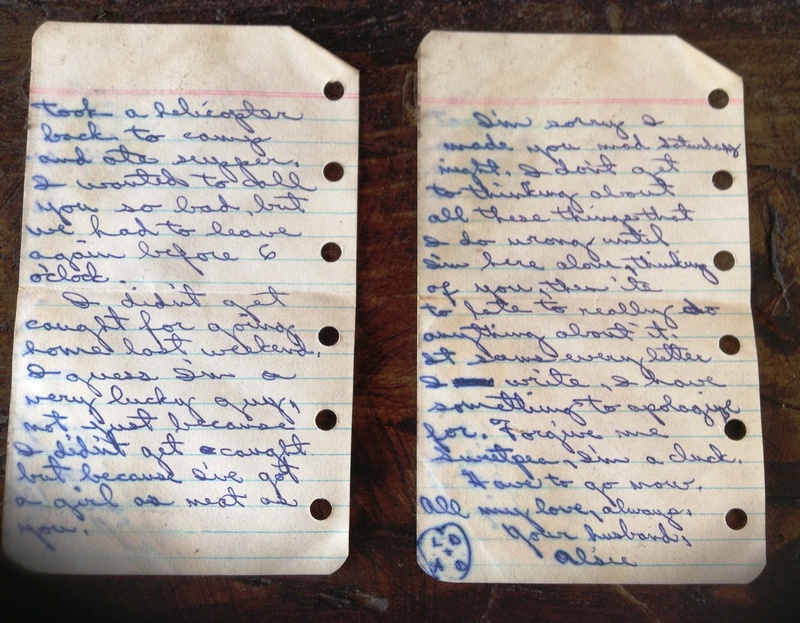 And you, Al, you’re in the letters, in the left-handed non-slant of the words you penned to me in the sixties. The opened box. 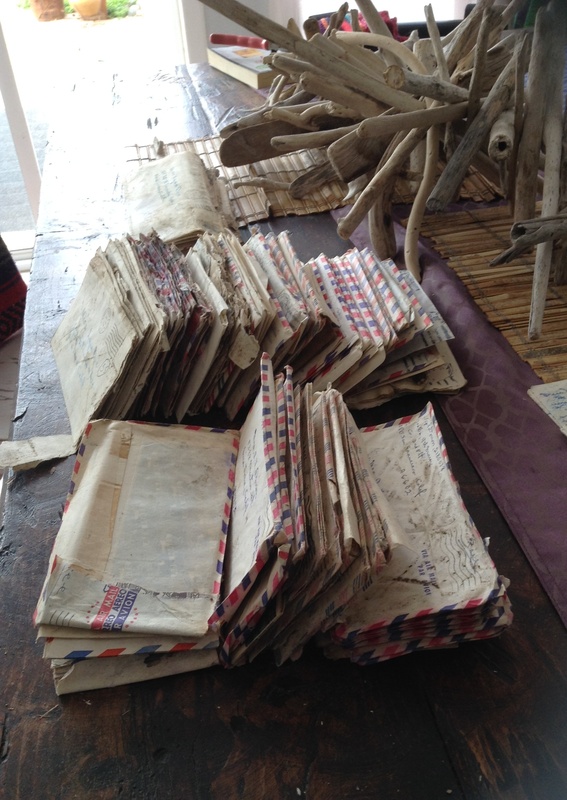 Letters written while in-country, 1966-67. In “the old learned way” of my letter writing, what followed an initial health inquiry was an apology—usually for such a late response—replete with excuses as to why I hadn’t answered sooner. Those old habits die hard. Alsie, I’m sorry for this delayed response! 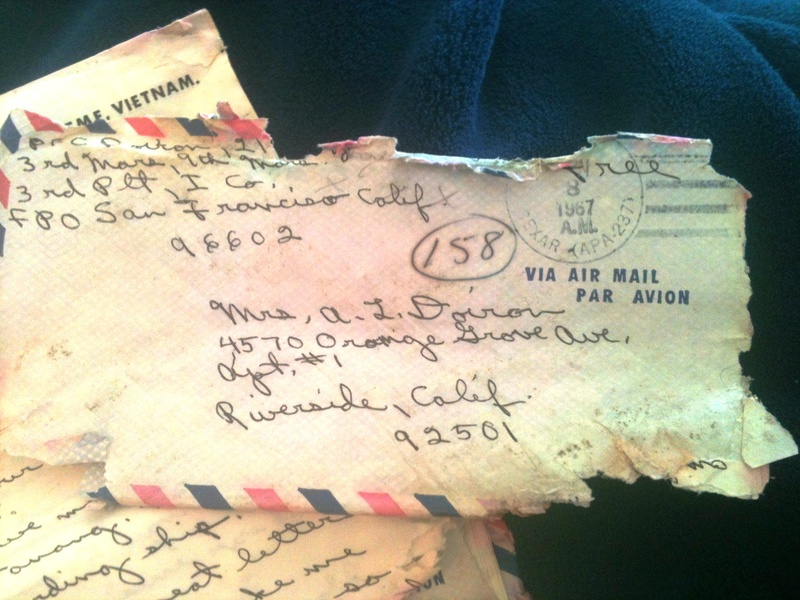 You knew I loved you back then, how I worried and missed you and answered your letters from ‘Nam almost as often and as rapidly as they were received. It’s a bigger, different love now. You’d think I would’ve gotten right on it, but on the day I came across the box, I’d already handled three bankers boxes and culled manuscripts—drafts of short stories, novel starts, memoir snippets, poetry, term papers, screenplays, fairytales, you-name-it—to fit into one box rather than three. Always prone to use ten words to say what could be said in three, it was mind-numbing—to say the least. By the time I pulled the fourth box from the closet (expecting more folders full of stuff written by me), I was pretty much a zombie. Then I removed the lid. Then I slipped the lid right back on. Your left-slanted handwriting was just underneath. You’d long-handed Mrs., printed Lynn Doiron, and long-handed Free where an unneeded postage stamp was intended. The blue ink and the red-white-blue dash work edging the airmail envelopes pulsed an image while I stared down and thought about what to do next. I could tuck all your words back into the dark recesses of the closet. I could haul the box over to the log house and store your letters there. I could find the duct tape and wrap it in dull silver until all the faux-woodgrain cardboard was covered completely and the whole of it took on the appearance of the Ark of the Covenant containing the powers of a god in whom I didn’t believe. I could do a Scarlett O’Hara and turn away, think about it, you, that war, those days—tomorrow. Alsie, it seems I won’t make it much further today than my lame opening inquiry as to your well-being and partial excuses for the delay in responding. Reading this, the you I once knew would offer a simple shrug about now, expecting nothing more for the moment and, more than likely, seriously doubting I’ll finish what I’ve begun. I owe you more than that. I know it and you, my dear heart, my tiny re-purposed energy blink of universe–know it, too–at least in these imagined moments of shared space and time. *P.S. I dreamed about Uncle Con and you the other night. He was berating me or possibly just giving me a hard time in his meant-to-be-funny-but-not-always-the-case manner about what a spoiled child I had been and what a spoiled woman I was and why on earth didn’t I give you the respect a man such as yourself deserved and how on earth could I date other men after your death and after the sorry (meaning low-down) way I ignored your iced tea glass when empty and why I hadn’t kept our car washed and waxed and spit-shine clean when you had so much to do to provide for me and our babies. In the dream I kept turning away, covering my ears and humming to blot out what Uncle had to say—but it was no use. Then Mama walked into the dream, joining her brother, agreeing with him. I slept badly (the fault of that damned dream) and woke around midnight. The stars were bright; the moon a sliver. Unfortunately, it wasn’t a shakable kind of dream and Uncle was still with me when dawn broke. Mama had departed the dream (just as she had departed from life in 1993). For several seconds after waking, I believed Uncle still lived in Colfax; if he called or vice versa I knew I’d be short-tempered; he’d caused me such a bad night. Valentine’s Day was spent looking for Susan. The manuscript, Susan Parker Says to Say Hello, isn’t here, isn’t stashed in a drawer or a cupboard or box under the bed or filing cabinet, didn’t make the trip down I-5 from Cottonwood, California to cross the border into Mexico. She’s vanished, Susan Parker has, and the flash drives/memory sticks I found are no longer readable by this current computer; the same is true of the CD found with “Susan Parker” inked in black on its face. In the absence of Susan, the first eleven pages of The Dalan Chronicles were attached and sent to writers I haven’t yet met–with the exception of Alice–who will surely think I’m a nutcase writer–with the exception of Alice who knows me and more than likely reached this conclusion circa 2006. What is drawn to the sheet of white paper is drawn in black: a dot, slightly more than a simple clean dot, outside an empty square. There’s the immediate sense of one entity set outside of another. The square could represent a community. Or a garden. But the garden is empty, without even so much as a seed; the community without family, neighbors, friends, strangers passing through. It would be a lonely place to enter. And how the dot, legless and wingless as it is, could get inside the garden/community – does have its own set of problems. There is, of course, the idea of momentum, of rolling across the fractional distance separating the dot from the field (for I have now seen that the square might be a field). One would only need lift the upper left corner of the paper and give a slight shake to loosen the drawn dot from where it is grounded, then tilt the paper incrementally to guide the dot’s roll toward the nearest line of the square. This is, of course, assuming the dot would be happier inside the square than it is on the outside. How can an observer know, I mean, know for certain, a singular dot’s desire? Isn’t it possible, within the realm of imaginative possibilities, that the dot drawn to this page has spent a good deal of its life considering where it would most like to be? And, having made a decision, has willed itself beyond the enclosure? Isn’t it possible that this dot with its slightly rumpled appearance is only pausing at its current location, briefly acknowledging a place where it has been, before moving further away from the place it used to call home. Then again, anyone reading this, or listening, would, more than likely, begin to try to process a whole series of questions like: What on God’s green earth is she talking about? Ink doesn’t think. Ink doesn’t consider. Ink doesn’t have a ‘life.’ How long is she going to take up my time with this? How long am I going to waste my time with this? Finally, I would say – I’m finished now, quite finished.